This title was first published in 2001. After languishing for decades in the domains of rigid doctrinalism and confusing theory, the conflict of laws is increasingly being recognized as an important area of law to a global community. 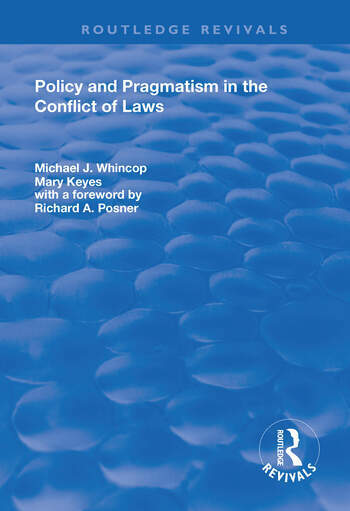 To demonstrate its importance, Michael Whincop and Mary Keyes transcend the divide between the English pragmatic tradition and the circularity of American policy-based theory. They argue that the law governing multistage conflicts can minimize the social costs of litigation, increase the extent of co-ordination, facilitate private ordering and limit regulatory monopolies and cross-border spillovers. Pragmatic in outlook and economic in methodology, they pursue these themes across a broad range of doctrinal issues and offer valuable links to parallel analyses in domestic contexts. Contents: Introduction; Theory in conflict of laws; Contracts; Mandatory rules and statutory interpretation; Market torts and concurrent liability; Non-market torts; Property; Jurisdiction and procedure; Corporations as subjects of jurisdiction; Beyond the nation state; Bibliography; Index.